Data analysis with Airdata is simple yet powerful. Fly your drone using a supported flight app. Upload post-flight data. Get immediate flight intelligence. Uploaded flights remain private unless you choose to share them. Having Trouble Uploading Files Manually? Please register to upload flight logs, it's FREE. Android users: Plug your tablet via USB cable to your PC and access it like a USB drive. For DJI GO 3, the files are in the folder "DJI/dji.pilot/FlightRecord". For DJI GO 4, the files are in the folder "DJI/dji.go.v4/FlightRecord". iOS users Here is a helpful video explaining how to get these. As explained in the video - you need the "FlightRecords" folder and not the "Logs" folder. In order to upload flights from DJI GS PRO, please follow these instructions. The easiest way to upload from Litchi is to do it automatically. If you need to upload manually, plug your tablet via USB cable to your PC and access it like a USB drive. The easiest way to upload from AutoPilot is to do it automatically. If you need to upload manually, you need to connect your phone or tablet to a desktop computer and download the files using iTunes. 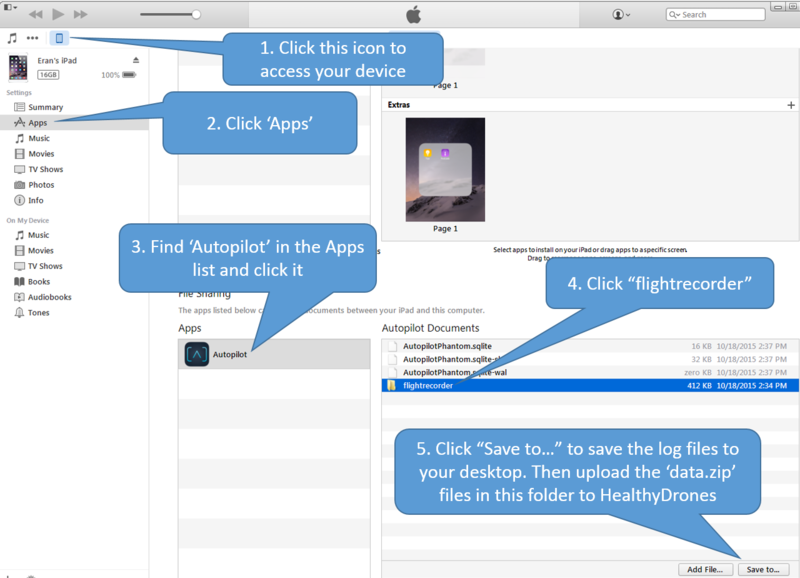 Click here to see a screenshot explaining how to access these files in iTunes. In order to upload flights from MapPilot/Maps Made Easy, please follow these instructions. In order to upload flights from DroneDeploy, please follow these instructions. In order to upload flights from Drone Harmony, please follow these instructions. The easiest way to upload from DJI Ultimate Flight is to do it automatically. In order to upload flights from Pix4D Capture, please follow these instructions. In order to upload flights from SkyWatch, please follow these instructions.